As was noted at the very beginning of this chapter, one of the good things about groundwater as a source of water is that it is not as easily contaminated as surface water is. But there are two caveats to that: one is that groundwater can become naturally contaminated because of its very close connection to the materials of its aquifer, and the second is that once contaminated by human activities, groundwater is very difficult to clean up. Groundwater moves slowly through an aquifer, and unlike the surface water of a stream, it has a lot of contact with the surrounding rock or sediment. In most aquifers, the geological materials that make up the aquifer are relatively inert, or are made up of minerals that dissolve very slowly into the groundwater. Over time, however, all groundwater gradually has more and more material dissolved within it as it remains in contact with the aquifer. In some areas, that rock or sediment includes some minerals that could potentially contaminate the water with elements that might make the water less than ideal for human consumption or agricultural use. Examples include copper, arsenic, mercury, fluorine, sodium, and boron. In some cases, contamination may occur because the aquifer material has particularly high levels of the element in question. In other cases, the aquifer material is just normal rock or sediment, but some particular feature of the water or the aquifer allows the contaminant to build up to significant levels. An example of natural contamination takes place in the bedrock aquifers of the east coast of Vancouver Island and the adjacent Gulf Islands. The aquifer is the Cretaceous (90 Ma to 65 Ma) Nanaimo Group, which is made up of sandstone, mudstone, and conglomerate (Figure 14.17). The rocks of the Nanaimo Group are not particularly enriched in any trace elements, but the submarine-fan sandstone that makes up much of the group is a lithic wacke, and therefore has relatively high levels of clay (for a sandstone). This clay is good at adsorbing some elements from the water and desorbing others, and in the process, its pH goes up (it becomes alkaline). At high pH levels (some as high as 9 in the Nanaimo Group), the element fluorine that is present naturally in the rock (as it is in almost any rock) has an increased tendency to dissolve in the water. In some areas, groundwater in the Nanaimo Group has fluorine levels that are well above recommended levels for drinking water. The World Health Organization (WHO) maximum acceptable concentration (MAC) for fluorine is 1.5 mg/L (milligrams per litre). Between 5% and 10% of the domestic wells around Nanaimo and adjacent Gabriola Island have more than that, some as much as 10 mg/L. A small amount of fluorine in the human diet is considered important for maintaining dental health, but high levels can lead to malformation and discolouration of teeth, and long-term exposure can lead to other more serious health effects such as skeletal problems. Nanaimo Group groundwater can also have elevated levels of boron, again related to pH and adsorption from clay minerals. While boron at the levels found there is not toxic to humans, there is enough boron in some wells to be toxic to plants, and the water cannot be used for irrigation. Rural residents in the densely populated country of Bangladesh (over 1,000 residents/km2, compared with 3.4/km2 in Canada) used to rely mostly on surface supplies for their drinking water, and many of these were subject to bacterial contamination. Infant mortality rates were among the highest in the world and other illnesses such as diarrhea, dysentery, typhoid, cholera, and hepatitis were common. In the 1970s, international agencies, including UNICEF, started a program of drilling wells to access abundant groundwater supplies at depths of 20 m to 100 m. Eventually over 8 million such wells were drilled. Infant mortality and illness rates dropped dramatically, but it was later discovered that the water from a high proportion of these wells has arsenic above safe levels (Figure 14.18). 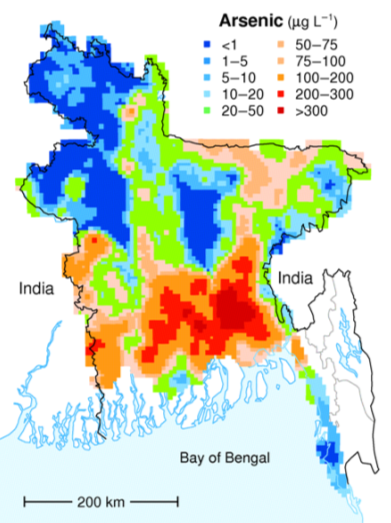 Figure 14.18 The distribution of arsenic in groundwater in Bangladesh. The WHO recommended safe level for arsenic is 10 μg/L. All of the green, orange, and red areas on the map exceed that limit. Most of the wells in the affected areas are drilled into relatively recent sediments of the vast delta of the Ganges and Brahmaputra Rivers. While these sediments are not particularly enriched in arsenic, they have enough organic matter in them to use up any oxygen present. This leads to water with a naturally low oxidation potential (anoxic conditions); arsenic is highly soluble under these conditions, and so any arsenic present in the sediments easily gets dissolved into the groundwater. Arsenic poisoning leads to headaches, confusion, and diarrhea, and eventually to vomiting, stomach pain, and convulsions. If not treated, the final outcomes are heart disease, stroke, cancer, diabetes, coma, and death. There are ways to treat arsenic-rich groundwater, but it is a challenge in Bangladesh to implement the simple and effective technology that is available. Groundwater can become contaminated by pollution at the surface (or at depth), and there are many different anthropogenic (human-caused) sources of contamination. The vulnerability of aquifers to pollution depends on several factors, including the depth to the water table, the permeability of the material between the surface and the aquifer, the permeability of the aquifer, the slope of the surface, and the amount of precipitation. Confined aquifers tend to be much less vulnerable than unconfined ones, and deeper aquifers are less vulnerable than shallow ones. Steeper slopes mean that surface water tends to run off rather than infiltrate (and this can reduce the possibility of contamination). Contamination risk is also less in dry areas than in areas with heavy rainfall. Studies of groundwater vulnerability have been completed for various regions of British Columbia. 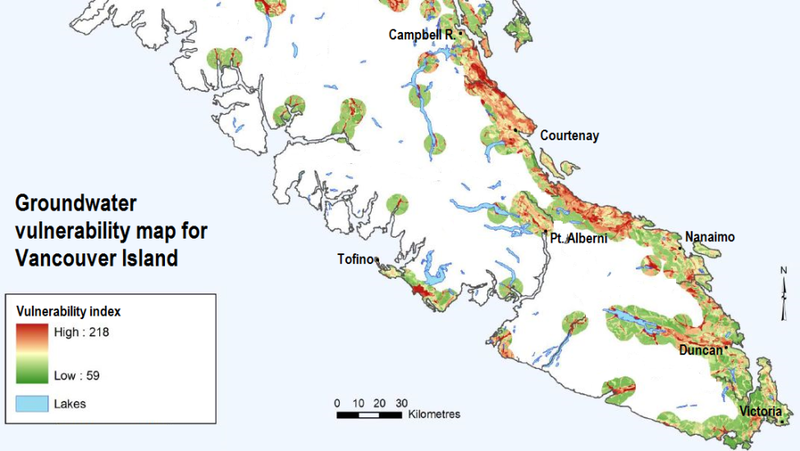 A groundwater vulnerability map for southern Vancouver Island is shown in Figure 14.19. The yellow to red areas are considered to have high vulnerability to pollution from surface sources, and most of these are where the aquifers are unconfined in quite permeable unconsolidated sediments of either glacial or fluvial origin, where the water table is relatively shallow and the terrain is relatively flat. Intensive agricultural operations and golf courses can have a significant impact on the environment, especially where chemicals and other materials are used to enhance growth or control pests. An example of agricultural contamination is in the Abbotsford area of the Fraser Valley, where nitrate levels above the 44 mg/L maximum acceptable level (expressed as nitrate) in the Abbotsford-Sumas aquifer have been observed since the 1950s; however, the problem became much worse as agriculture intensity increased in the 1980s. By 2004, groundwater with nitrate levels in excess of 44 mg/L was reported over an area of about 75 km2 around Abbotsford, and the problem extended across the border into the Sumas area of Washington State. This region is intensively used for berry crops (especially raspberries and blueberries) and large poultry operations, as well as lesser amounts of grazing and forage crops. Chicken manure is typically stored in fields adjacent to chicken barns, and may release nitrogen to the environment from runoff water, and from releases of ammonia gas. Over decades, both chemical fertilizers and chicken manure and other manures have been applied to the berry crops to provide extra nitrogen to help maximize berry growth. If the fertilizer added is in excess of what the plants need, or is poorly timed compared to when it is needed, then the extra nitrogen may be leached into the groundwater below. Berry crops are irrigated over the summer to help the crops grow. Summer irrigation and winter rainfall may carry excess nitrate from the near surface to the aquifer below. Since the 1990s, agricultural practices have been tightened up to reduce the rate of groundwater contamination, but it will take decades for nitrate levels to drop in the Abbotsford-Sumas aquifer. Agriculture and Agri-Food Canada and many others are conducting research on better irrigation and nitrate management techniques to reduce the amount of nitrogen that leaches to groundwater. In the past, domestic and commercial refuse was commonly trucked to a “dump” (typically a hole in the ground), and when the hole was filled, it was covered with soil and forgotten. In situations like this, rain and melting snow can easily pass through the soil used to cover the refuse. This water passes into the waste itself, and the resulting landfill leachate that flows from the bottom of the landfill can seriously contaminate the surrounding groundwater and surface water. In the past few decades, regulations around refuse disposal have been significantly strengthened, and important steps have been taken to reduce the amount of landfill waste by diverting recyclable and compostable materials to other locations. A modern engineered landfill has an impermeable liner (typically heavy plastic, although engineered clay liners or natural clay may be adequate in some cases), a plumbing system for draining leachate (the rainwater that flows through the refuse and becomes contaminated), and a network of monitoring wells both within and around the landfill (Figure 14.20). 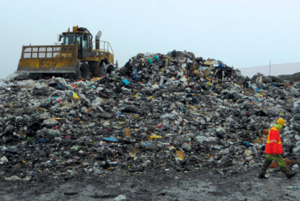 Once part or all of a landfill site is full, it is sealed over with a plastic cover, and a system is put in place to extract landfill gas (typically a mixture of carbon dioxide and methane). That gas can be sent to a nearby location where it is burned to create heat or used to generate electricity. The leachate must be treated, and that can be done in a normal sewage treatment plant. The monitoring wells are used to assess the level of the water table around the landfill and to collect groundwater samples so that any leakage can be detected. Because some leakage is almost inevitable, the ideal placement for landfills is in areas where the depth to the water table is significant (tens of metres if possible) and where the aquifer material is relatively impermeable. Landfills should also be situated far from streams, lakes, or wetlands so that contamination of aquatic habitats can be avoided. Today there are hundreds of abandoned dumps scattered across the country; most have been left to contaminate groundwater that we might wish to use sometime in the future. In many cases, it’s unlikely that we’ll be able to do so. Exercise 14.4 What Goes on at Your Landfill? 1. Which government body operates your landfill? 2. Where is the landfill situated? 3. 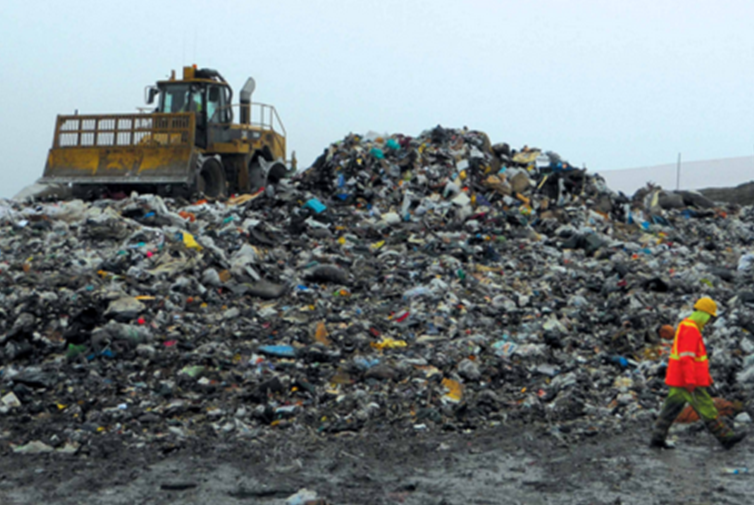 Is your waste all placed in a landfill, or are there other processes in use (e.g., incineration or composting)? 4. Are landfill gases captured, and, if so, what is done with them? 5. What could be changed to improve the waste disposal situation in your community (e.g., more recycling, compost collection, waste-to-energy technology)? Although western Canada doesn’t have the same extent of industrial pollution as other parts of the country, there are still seriously contaminated sites in the west, most with the potential to contaminate groundwater. 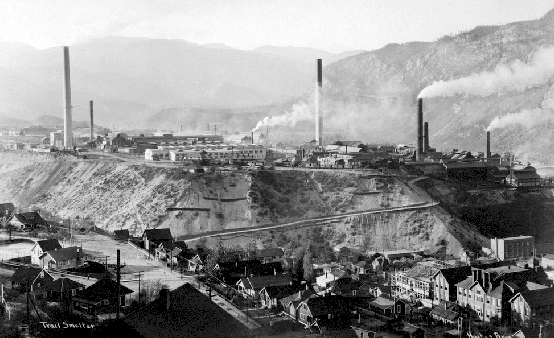 One example is the lead and zinc smelter at Trail, B.C. The largest in the world, it has been operating for over 100 years and has left a residue of metal contamination around the region (Figure 14.21). In some parts of Trail, the contamination is serious enough that existing soil has been removed from residential properties and replaced with clean soil brought in from elsewhere. This contaminated soil has contributed to contamination of groundwater in the Trail area. Groundwater beneath the actual smelter site is contaminated, and the operator (Teck Resources) is currently working on plans to prevent that water from reaching the nearby Columbia River. Mines and other operations that involve the excavation of large amounts of rock (e.g., highway construction) have the potential to create serious environmental damage. The exposure of rock that has previously not been exposed to air and water can lead to the oxidation of sulphide-bearing minerals, such a pyrite (FeS2), within the rock. The combination of pyrite, water, oxygen, and a special type of bacteria (Acidithiobacillus ferrooxidans) that thrives in acidic conditions leads to the generation of acidity, in some cases to pH less than 2. Water that acidic is hazardous by itself, but the low pH also has the property of increasing the solubility of certain heavy metals. The water that is generated by this process is known as acid rock drainage (ARD). ARD can occur naturally where sulphide-bearing rocks are near the surface. The issue of ARD is a major environmental concern at both operating mines and abandoned mines (see Chapter 20). In streams around the Mt. 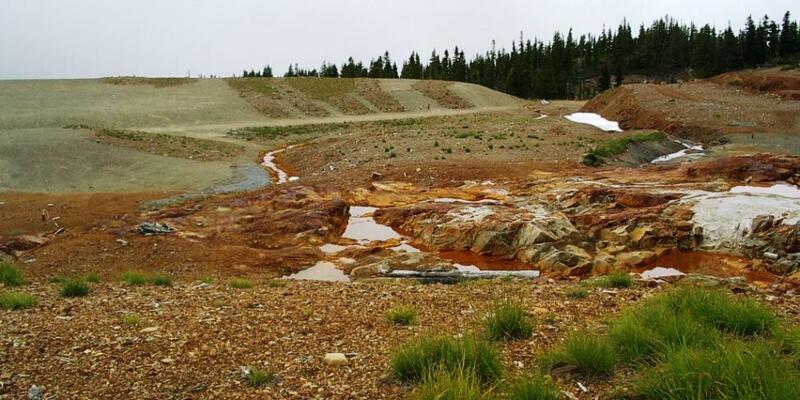 Washington Mine on Vancouver Island (Figure 14.22), copper levels are high enough to be toxic to fish. Groundwater adjacent to the contaminated streams in the area is very likely contaminated as well. Underground storage tanks (USTs) are used to store fuel at gas stations, industrial sites, airports, and anywhere that large volumes of fuel are used. They do not last forever, and eventually they start to leak their contents into the ground. This is a particular problem at older gas stations — although it may also become a future problem at newer gas stations. You may have noticed gas stations that have been closed and then surrounded by chain-link fence (Figure 14.23). In virtually all such cases the closure has been triggered by the discovery of leaking USTs and the requirement to cease operations and remediate the site. Petroleum fuels are complex mixtures of hydrocarbon compounds and the properties of their components — such as density, viscosity, solubility in water, and volatility — tend to vary widely. As a result, a petroleum spill is like several spills for the price of one. The petroleum liquid slowly settles through the unsaturated zone and then tends to float on the surface of the groundwater (Figure 14.24). The more readily soluble components of the spill dissolve in the groundwater and are dispersed along with the normal groundwater flow, and the more volatile components of the spill rise toward the surface, potentially contaminating buildings. There is almost certainly a leaking UST at a former gas station near you. Look for an empty property that is surrounded by a chain-link fence with “No Trespassing” signs. You might see evidence of monitoring wells (like those shown in Figure 14.24), and there could be some petroleum barrels around that are being used to store contaminated water. Once you’ve identified one of these, you’ll probably start seeing them everywhere! In areas that are not served by sewage networks leading to a central sewage treatment plant, most homeowners rely on septic systems for disposal of sewage. There are two primary components to a simple septic system, the septic tank and the drainage field (Figure 14.25). A typical septic tank is constructed of either concrete or plastic and has a volume of 5,000 L to 10,000 L (5 m3 to 10 m3). This forms the first treatment and is designed to be anaerobic (without oxygen). That promotes the activity of certain bacteria that help break down the waste. As the waste is degraded, some portions tend to sink to form sludge at the base of the tank, and others float to the surface, forming a scum layer. A septic tank may be divided into two parts to keep the sludge at the bottom and the scum on the top from draining out. The water then moves to the drainage field, which provides the right conditions for a different set of bacteria that operate in aerobic conditions. The drainage field includes an array of plastic pipes that are perforated to allow the effluent to drain out over a large area and seep slowly into the ground. In order to install a drainage field, it is first necessary to test the soil below, as it must be sufficiently permeable to allow the effluent to percolate away, but not so permeable that it flows too quickly and the soil is not able to filter out the pathogenic bacteria. If inappropriate chemicals are added to the waste stream, they may interfere with the natural breakdown of the sewage. If the tank is not periodically pumped out, solids can get into the drainage field and compromise the drainage, resulting in the flow of effluent toward the surface. If the soil is either not sufficiently permeable or too permeable, the effluent will not drain away (and will start to pool at the surface) or it will drain too quickly. If the drainage field is constructed in an area where the water table is close to surface, some of the effluent is likely to flow into the groundwater without being treated. As illustrated in the landfill example above, there are two fairly simple ways to significantly reduce the chance and degree of groundwater contamination from surface sources. One is to prevent rainwater from infiltrating down to the water table and picking up contaminants; this can be achieved by simply capping or roofing over the landfill, mine tailings, or spill site. The second is to provide an impermeable barrier beneath the contaminant. Modern landfills and mine tailings impoundments are all built using some combination of clay and engineered plastic barriers. Both of these solutions — caps and liners — are subject to failure due to leaks. Once contaminants are in the groundwater, the main form of remediation is to pump out the contaminated water and treat it at the surface. This can be a slow process, and preventing the contaminant from travelling significantly during this process can be accomplished by manipulating local groundwater flow through the extraction or injection of water at certain locations. Consider this in the exercise below. This diagram shows a groundwater contaminant plume in red. The source of the contamination has been removed but if the plume is not dealt with, it will eventually enter the stream and threaten the health of wildlife. Pumping the contaminant from well B for treatment will not be sufficient to prevent some of the contamination from making it to the stream. 14.4 Groundwater Quality by Steven Earle is licensed under a Creative Commons Attribution 4.0 International License, except where otherwise noted.